These behind-the-scenes photos are just too adorable! Stewart and Russell are quite clearly a charismatic and fun pair. I haven’t seen this movie (yet), nor do I have any idea of what this Genevieve Tobin character is like, but I’m sure I despise her already for coming between them, even if it is just a movie! OK first off I need to see this movie ASAP. Yes it is another of Roz’s movies that I have yet to see. But It’s on the must see list now. Secondly, thanks for the tidbits about Roz and Jimmy, as I did not they dated at one point and time. You see that’s why I look forward to your reviews Desiree, because you not only write an awesome review with great photos but also add so much more and facts and information about the stars and behind the scenes. I love that! Once again I love this series you are doing, so keep them coming. Congrats, another movie review made more interesting by telling us more about Rosalind Russell’s life. 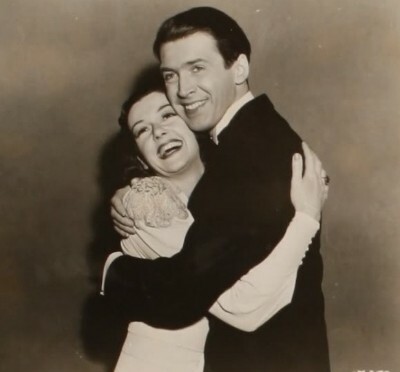 The chemistry between Roz and Jimmy Stewart is obvious in the movie clip, she is so beautiful and he is so young and handsome, I was just drawn in. The behind the scenes photos are great but the movie publicity shots are stunning, I swear you can feel the attraction between these two great actors.